Privacy, Privacy, Privacyâ¦Did I say Privacy? BOND PAID!!! On this magnificent, concrete block and stucco, designer Gardenia with golf cart garage, in the Village of Caroline, only two minutes from Lake Sumter Landing Town Square. Conveniently located on a large cul-de-sac lot with a never to be built on preserve in the rear, owned and maintained by The Villages. 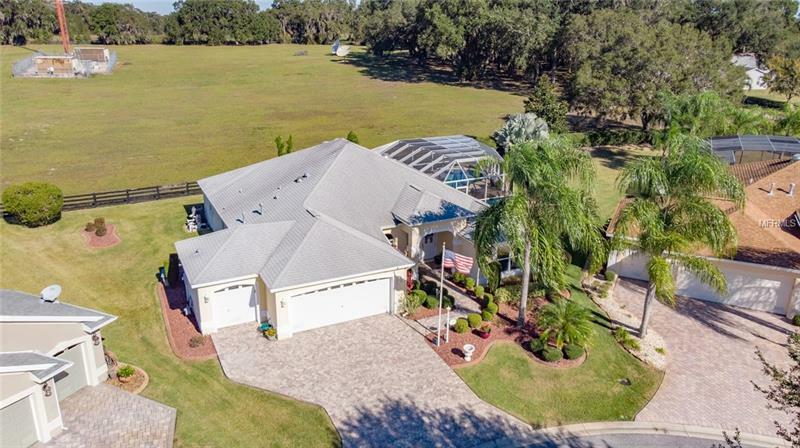 Enjoy your Florida retirement relaxing in a completely screened in the ground, heated pool or above ground hot tub in total privacy and bring your binoculars to enjoy birds and other wildlife. Less than one year old stainless steel appliances, granite countertops, under cabinet lighting, pull-out cabinet shelves, two solar tubes for natural lighting, a fold down Murphy bed in one of the bedrooms, crown molding with custom wood trim above the front door and rear SGD leading to the closed in, tiled and air conditioned/heated lanai, and two inch horizontal window blinds are just a few features of this one of a kind home. Feel secure with the whole house alarm system and listen to your favorite music or newscast on a complete home built in stereo system. Give away that vacuum! This home has large porcelain tile in the main area and bathrooms with REAL wood floors in the bedrooms. A beautiful, brick paver driveway leads to a garage with storage cabinets, acrylic floor, and a pull down, attic stair. Gas golf cart and some furniture included. You gotta see this one! Call your REALTOR today!